Drunken Jerk Prawns - are there any other kind? 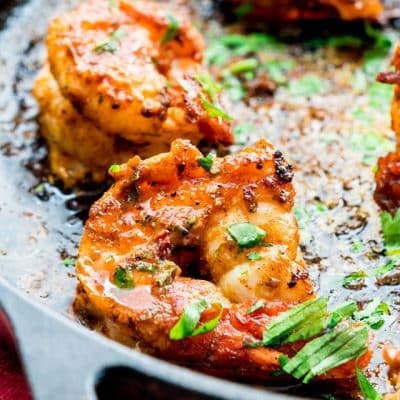 These prawns will blow your mind, beautifully seared plump and juicy shrimp marinated in a easy bourbon and jerk spice marinade. Simple and succulent with a bit of a kick. Devein the shrimp if necessary and remove the shells but leave the tails on. In a medium size bowl add the bourbon, lemon juice, jerk seasoning and whisk well. Add the prawns to the bowl and toss them around making sure all the prawns are covered in the marinade. Refrigerate for 5 minutes. Add the oil and butter to a skillet and melt the butter over medium-high heat. Add the prawns to the skillet, reserve leftover marinade. Cook for 2 or 3 min until the prawns turn pink, then flip over. Pour about 1/4 cup of the leftover marinade over the prawns and cook for another 3 minutes and they are cooked through. You'll notice the sauce will reduce almost right away caramelizing the prawns a bit. Remove shrimp from the skillet. Garnish the prawns with parsley and serve while still warm. You can find the recipe for Jamaican Jerk seasoning here. Feel free to use and type of whiskey, rum, or brandy in place of the bourbon. If you'd like to go alcohol free, simply omit the bourbon. If you want a saucier consistency use chicken or vegetable broth.